Decree of appointment of the newly beatified martyrs of Pueyo as Patrons of the monastic branch of IVE. We offer you a circular from Fr. Carlos Walker, IVE, General Superior of the Institute of the Incarnate Word, regarding the upcoming feast of Blessed John Paul II, “father of our religious family,” which will be celebrated on October 22nd. Since on the coming Sunday the 13th, we begin the novena in honor of our Patron and Father, Blessed John Paul II, whose feast is celebrated on the 22nd of October, we wish to remind you of the proximity of this feast and invite you to celebrate it fittingly in the various jurisdictions and the houses of the Institute. On Monday the 22nd, we will celebrate the Holy Mass in the Basilica of St. Peter, in the altar of the tomb of Blessed John Paul II. All the members of our Religious Family who are in Italy will assist at this Mass. Afterwards, the members of the male branch will go to the General House for a festive lunch, and to continue with the feast in the evening. In another attached document, I am sending you a prayer to John Paul II, which could be used during these days of preparation for the feast. This prayer was written by a priest of the Province of Loreto and was translated into Spanish by the seminarians in Montefiascone. May Blessed John Paul the Great obtain for us the grace to be faithful to our charism, and through his intercession, may God send many holy vocations to our Institute. you, who are the Spiritual Father of our religious family of the Institute of the Incarnate Word , obtain for us the grace that we ask in this novena. 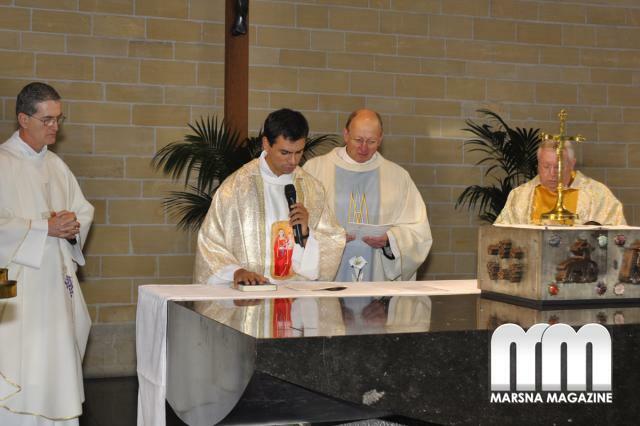 With trust we ask that we may become holy priests of the Institute of the Incarnate Word , according to the heart of Christ : who nourish our spirits with the Word of God, serve our neighbors in solidarity with the needy, abandon ourselves to Divine Providence , tireless preachers , “rich in spirit” “with tongue , lips and wisdom, which the enemies of truth cannot resist”, merciful confessors, who are exceptionally fruitful in our apostolic and vocational efforts, not elusive to the missionary adventure , always cheerful – even in difficulties, lovers of the Cross and true devotees of the Blessed Virgin Mary. We ask that we may be always faithful to God, fulfilling at all times His Holy Will and persevere until death in this religious family. May the Most Blessed Virgin Mary, Mother of Priests , whom you loved so much and to whom we profess to be her slaves of love, protect us from on high from all dangers, temptations, and attacks of the devil, that we may one day reach Heaven along with all those souls who have been entrusted to us during our entire ministry. Amen . Pater , Ave and Gloria. 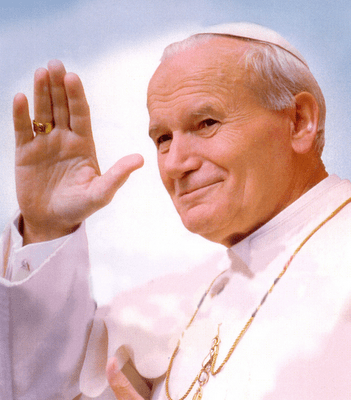 Blessed John Paul II, pray for us (3 times). Cf. IVE Constitutions, n. 231. Letter from Fr. Carlos Walker to provincial superiors of the Institute of the Incarnate Word with the occasion of the recently concluded VII General Conference. It is well known that in the war that has long hit Syria there has been constantly increasing violence. The news of recent days indicates a worsening of the conflict, which seems to be far from reaching a solution. Our Christian brothers are the most affected, and there is evidence of numerous martyrdoms in the hands of Islamist hordes. Similarly, the situation in Egypt is extremely delicate, where in the past week, more than 60 Christian churches and religious houses were burnt down, putting the country in danger of a civil war and unleashing a persecution against Christians. The Holy Father Francis, during the recitation of the Angelus last Sunday in Rome, resolutely called for peace, appealing to the authorities of the international community to make every effort to find a solution that will bring back peace to Syria. The Pope also urged us to unceasingly invoke the Queen of Peace that she may intercede with her Son and grant the gift of peace to these martyred regions. The General Government of the Institute, echoing the call of the Pope and that of a proposal received from our monks, and in agreement with the General Government of the Servants of the Lord and the Virgin of Matará, has decided to summon all the religious of our religious family to pray and offer sacrifices for peace in Syria and Egypt. In a particular manner, we propose that in all our houses and apostolic works (parishes, Houses of Mercy, schools, etc..), the coming Sunday, September 1, be a special day dedicated to prayer for peace, especially offering the Holy Sacrifice of the Altar for this intention, and asking our communities and parishioners to pray for the same purpose. As I had told you in my previous circular, in which we had convoked a similar day of prayer on 23rd December, we place our complete trust in the words of Our Lord Jesus Christ, who said: “I say to you, if two of you agree on earth about anything they ask, it will be done for them by my Father in heaven. For where two or three are gathered in my name, there am I in the midst of them” (Mt 18,19-20). In particular, we ask you to remember our missionaries who are in these tormented regions, and also the parishioners and beneficiaries of our missions there. We put these intentions in the hands of Mary, Queen of Peace and Mother of the Prince of Peace. On the day of the Feast of the Transfiguration of Our Lord Jesus Christ, the day in which we also recall the specific end of our Institute of the Incarnate Word, I send my regards to everyone with the desire that you are doing well. May Mary Most Holy grant us to be faithful to the mission that the Lord has given us.